Tableros Losan is a particle board factory that, due its activity, produces a lot of dust and bark as wastes, which can be exploited to produce energy (biomass). Bark was burned in an existing thermal oil boiler while dust was burned in existing dryers. 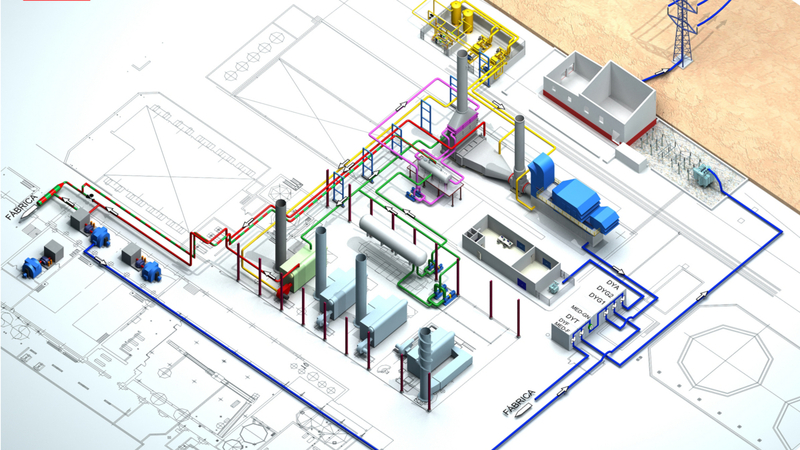 With the aim of improving factory’s competitiveness and due to the fact that not all generated biomass could be used, it was decided to install a cogeneration plant of 22.9 MW in combined cycle (gas turbine of 19.4MW and steam turbine of 3.5MW) and a simple cycle biomass plant where 4 MW were generated. The combined cycle cogeneration plant can supply all thermal demand of the factory (2.3 MWt of thermal oil and 13.9 MW of hot gases to the dryers). Part of the exhaust gases from the gas turbine are sent to a thermal oil generator and after passing it, they are sent to two wood shavings dryers. Exhaust gases, which are not used to produce thermal oil or sent to dryers, are sent to a heat recovery steam generator where 18.8 t/h of superheated steam (41.5 bar(a) and 400ºC) are produced for heating condensates coming from the steam turbine of the biomass plant and from the combined cycle steam turbine. 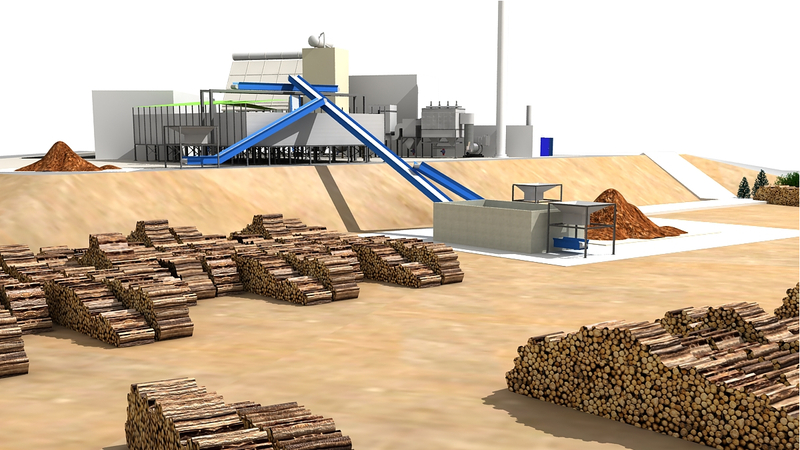 The biomass plant (its fuels are bark and dust) burns the fuel that no longer has to be used to produce thermal oil and hot gases for dryers, in a boiler to produce 21,1 t/h of superheated steam (41.5 bar(a) and 400ºC) that is sent to a steam turbine to produce 4 MW. The bark is transported, from the storage area to the biomass boiler through a driving system with redler conveyors. With regard to dust, it is transported, from storage silos to the biomass boiler, by a pneumatic suspension system. Bark and dust are two fuels with different characteristics that burn at different points and also different conditions. That's why bark is burned in a grate firebox combustion chamber and dust is burned in a separate combustion chamber, with an specific burner. Central de biomasa que permite la generación de vapor en una central formada por un generador de vapor con cámara torsional y un sistema de secado. 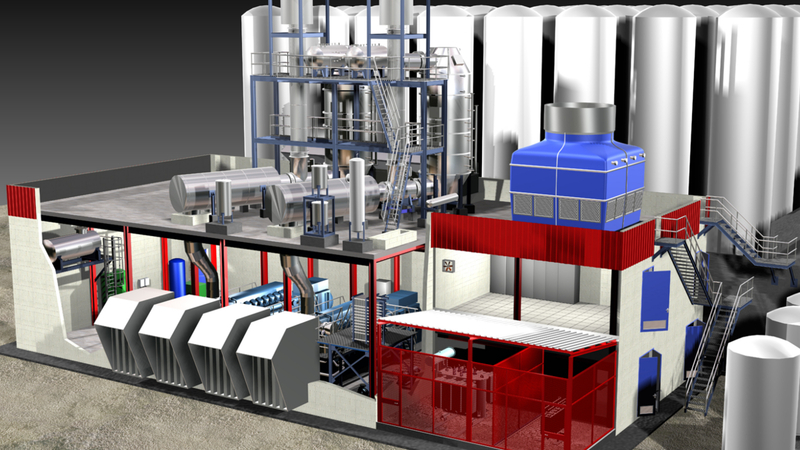 Combined cycle cogeneration plant with gas turbine and steam turbine, and a biomass plant. Central de cogeneración con una microturbina con biomasa como combustible.